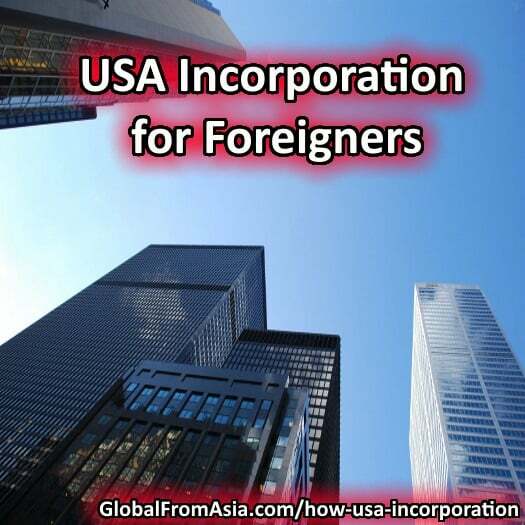 Looking to set up a US company as a non-citizen? This is a guide in response to the huge response we received on how to open a US bank account from overseas. The best way to open a US bank account as an overseas non-resident is to register a US company, and today we will go through that process, enjoy! 1. Choose a business structure: Sole proprietorship, partnership, Limited Liability Company (LLC), Corporation (C) or Nonprofit Corporation. For an e-commerce startup or web-based business, an LLC is the most common type of business structure for its tax advantages and reduced paperwork and fees. 2. Choose a state to register your business in: If your company has a physical address in the United States, then you must register your business in that particular state. However, if you run a business with no physical address (such as e-commerce), you can form a corporation or LLC in either Nevada or Delaware – these are the two most business friendly states. In fact, Delaware doesn’t even require any business entities to have any business activities or offices located in Delaware – a registered agent will suffice. 3. Get an Individual Taxpayer Identification Number (ITIN): The purpose of a tax ID is to allow your business to hire workers, open a US bank account, pay taxes and obtain a business license. You can apply for a free ITIN with the Internal Revenue System or IRS using this form. Company Name: The business name must be unique. Registered Agent: The role of the registered agent is basically someone who accepts and receives tax and legal documents on your behalf, especially if you don’t have a physical address in the US. This agent scans and emails these documents to you, and, if necessary, internationally ships them to you. Although it seems similar to a mail-forwarding service, a registered agent is a statutory agent designated to accept official state documents and legal documents. Total number of authorized shares for the corporation and the par value assigned to such stock. 6. Start the business: Build a website, create a company logo, advertise and market your products/services, and, most importantly, understand all the tax implications in your state and country. Can a non-US Citizen incorporate from abroad? Yes, you can hire an attorney to do all the paperwork on your behalf, or register online through legal filing services. How long does incorporation take? The total turnaround time depends on the chosen state. Typically, the fastest can take 2 days, and the longest can take up to 5 weeks. Can I use my Registered Agent’s address as my mailing address? No. A registered agent’s main role is only to receive tax and legal documents, and that doesn’t include client/business mail. If you would like to receive such mail, you will have to get a separate physical US address or avail a mail-forwarding service. Am I required to obtain a business license? Yes, if your business has a local physical office in the US; otherwise, no. What’s the difference between EIN and ITIN? Which one do I need? EIN: A unique identification number that is assigned to a business entity so that they can easily be identified by the Internal Revenue Service. (Source: Investopedia) EIN is a free service offered by the Internal Revenue System. Apply Online: Any entities whose principal business, office or agency, or legal residence (in the case of an individual), is located in the United States or U.S. Territories can apply for an EIN online. Applicants must possess a valid TIN/ITIN or Social Security number in order to apply. Availability of online application process depends on IRS hours of operation that is Monday to Friday, 7 a.m. to 10 p.m. Eastern Standard Time. After all validations are done, EIN can be acquired the same day. Apply by Fax: To apply by FAX, one must fill out the form SS-4 and fax it directly to IRS. If you’re located at one of the 50 states or the District of Columbia, you may send the form to Fax number: (855) 641-6935. If you have no legal residence, principal place of business, or principal office or agency in any state, send it to Fax: (855) 215-1627 (within the U.S.) Fax: (304) 707-9471 (outside the U.S.) Make sure to provide a fax number where IRS can fax back your EIN. If no fax number is provided, process can take up to 2 weeks. Apply by Mail: If you opt to apply via mail,you must also fill out the same form SS-4 mentioned above and mail it to appropriate address you can find on this link. This process takes about 4 weeks. Apply by telephone: For international applicants who wish to apply for an EIN via telephone, they only need to call IRS with the number: 267-941-1099 and provide all the information needed in the form SS-4. Make sure to make a call during IRS operation hours from Monday to Friday, 6:00 a.m. to 11:00 p.m. (Eastern Time). EIN can be obtained the same day after successful conversation with the IRS representative. You can get an EIN without a social security number. In fact you can do this over the phone. At least this is for foreigners and/foreign corporations. I know no one likes people who point out mistakes of other, but I’m a great fan of your stuff. Looking to Get the USA VIP Treatment? Enjoyed this article and looking for a professional service provider help you with all your US business needs? Then check out Global From Asia’s USA VIP package today for various ways we can help you with your US virtual address needs. always looking to make connections in the industry, thanks for reaching out!